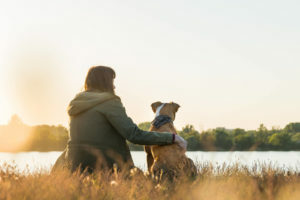 For dog owners who enjoy sharing their stroll around a local lake or pond with their best friend, remember to keep your pooch out of the water. A favorite columnist with the Longmont Times Call, Johnnie St. Vrain, recently addressed a question regarding leash rules for pets visiting the city’s lakes. Below is the article that clarifies dogs are not allowed in any Longmont body of water (whether on-leash or off) except for the dog beach at Union Reservoir. The team of Scoopy Doo’s in Longmont hopes you continue to enjoy peaceful walks with your pet around the local lakes! Dear Johnnie: Are there any rules about letting dogs loose or even on leash in Longmont’s ponds/lakes? I’m curious after an experience I had fishing at the fairgrounds pond on Memorial Day when I think I was the only person fishing in the whole place and a woman brought her two “little darlings” right next to me and let them loose in the water. Dear Gimme: Yes, there are rules, and they are quite clear. The only places dogs may be off leash on public places in the city are at dog parks and at the dog beach at Union Reservoir. No dog is allowed in any body of water in Longmont, other than that small part of Union, even if it is with a leash. If a dog owner won’t leash her “little darlings” or keep them out of the lake after a polite request on your part, call animal control (303-651-8500). But remember that Longmont Animal Control avoids getting into “he said, she said” disagreements. When I wrote about doggie “poo-peptrators” last year, Officer Tammy Deitz suggested video, with the owner and dog clearly identifiable, as a way to keep this from being your word against the dog owner’s, although I’d think that a couple of wet dogs at a lake might be evidence enough. And remember, Scoopy Doo’s offers quality dog poop scooper services to Longmont, Niwot, Gunbarrel,Boulder, Lafayette, Louisville, Colorado. We personally take care of your dog’s business, so you don’t have to! 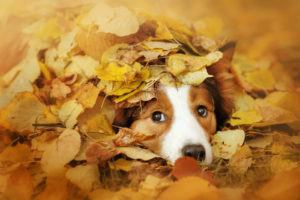 With Fall almost over here in northern Colorado, pet owners may be considering a dog waste service to deal with all the hidden piles under the leaf piles! Scoopy Doo’s of Longmont offers affordable and reliable dog waste service in every season and through all kinds of weather. Below are answers to some of our most frequently asked questions. Does my gate need to be unlocked? During our initial consultation, we will discuss how to best gain access to your backyard. If you prefer to keep your gate locked, you can provide us with an extra key or the combination. Other clients just leave their gate unlocked on the day of their service. If there is an additional area besides the backyard that you would like serviced, please also mention this during the consult. Can my dog be outside while you’re working? The highlight of this job is getting to interact with your furry family member(s)! We have experience befriending all ages and breeds of dogs, but have encountered some pups that will not allow us to enter the yard. If your pet is fearful of strangers or might react aggressively, we ask that they be kept inside or confined on our service day. Will be my service be delayed for bad weather? Your pet has to do their business no matter what the weather is so we will also do our job in all weather conditions, unless safety is a concern. If a severe weather alert has been issued for the area, we will monitor conditions and adjust our schedule if necessary. We work year round, through every season. We observe July 4th, Thanksgiving, Christmas & New Year’s Day but will work ahead of schedule during these weeks. It is important to us for our clients to have a clean property so they can enjoy spending time with their family on these special days! What if I go on vacation or need to cancel service? Whether you would like to skip one day, postpone service for an extended period or cancel altogether, we just ask to be given 48 hours notice via phone or email. We do not require our clients to sign a contract, so you can cancel at anytime- we strive to make our service convenient, never a hassle! If you have any other questions, we would be happy to discuss the details of Scoopy Doo’s dog waste service– call or email us today! We look forward to talking with you! 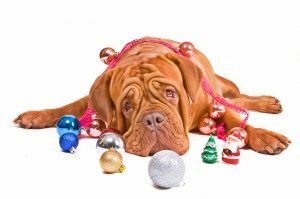 You probably don’t give a lot of thought to what you use to pick up your pet’s poop- but we do! 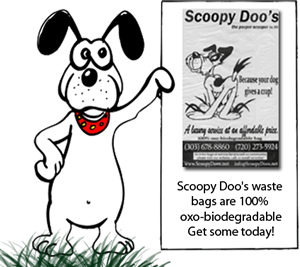 Scoopy Doo’s of Longmont uses oxo-biodegradable bags for our pet waste service because the health of your pooch, family and also our environment are all important to us! 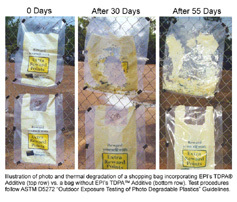 What happens to oxo-biodegradable plastic bags when thrown away? Plastics are made of large polymer molecules formed by carbon and hydrogen. These molecules degrade, or break down, with oxygen. This process happens at a very slow rate for conventional plastics. When a prodegradant is added to oxo-biodegradable bags, this process is drastically accelerated. Depending on the environment, an oxo-biodegradable bag will disintegrate within a few weeks to 1-2 years, which is still hundreds of times faster than unaltered bags. When an oxo-biodegradable bag breaks down into small enough fragments, it will then “biodegrade into carbon dioxide, water and biomass (cell structure of micro-organisms)” according to the results of laboratory simulated composts conducted by Environmental Products Inc. So instead of persisting in the environment for ages, an oxo-biodegradable bag that contains catalytic additives will return to the natural biocycle in a relatively short timeframe. That was a lot of scientific jargon to basically say that your pup’s poop won’t be forever preserved in plastic! Not only keeping your backyard clean but also our shared environment matters to us at Scoopy Doo’s and that is why we use oxo-biodegradable bags for our pet waste service! If you would also like to have these environmentally-friendly pet waste bags on hand, we keep them in stock and sell them for just $15 for a 200 count roll. Maybe you’ve never considered hiring a pooper scooper because you thought the cost would be prohibitive, but you will reconsider after learning how surprisingly reasonable this service is! Scoopy Doo’s of Longmont offers incredibly cheap pet waste service to residents and property managers in Boulder County. A consistently cleaner yard is the biggest benefit of hiring a regularly scheduled pet waste removal service. Minimizing the risk of infection from diseases transmittable by feces is invaluable, especially if you have children! And our employees remove all types of waste including trash- not just dog poop. 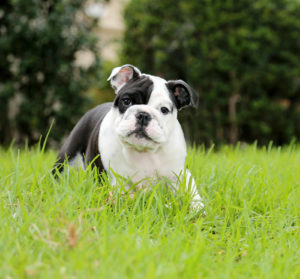 Of equally important value is the extra safeguard to your dog’s well-being. You will be notified of anything irregular in your pet’s stool right away so any health issues will hopefully be caught early. Another top benefit is an overall safer yard- we will report anything of concern like a hole in the fence, problem with a gate latch or anything valuable that has been left outside. Finally, you can spend the time it usually takes to pick up after your dog doing something else more enjoyable! Our weekly price is just $8.08 for 1 dog – many people spend more than that on lattes! We also offer a flat monthly fee plan or a one-time service, depending on your need and what schedule works best for your situation. So if you’d like to take this unpleasant task off your chore list, visit our website or give us a call for a free quote. The team at Longmont Scoopy Doo’s will be happy to answer any questions you might have about how our cheap pet waste service works.